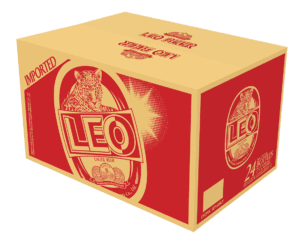 Recently Launched in the UK Leo beer is currently sold in 22 countries around the globe. It is the #1 product in the Thai home market with circa 50% market share meaning it is recognised by consumers who have visited Thailand and appreciated by “foodies” who are looking for that authentic experience. It has been honoured the Gold Medal for Best Beer Quality Award by the World Beer association and has recently been awarded Asia Most Trusted Brand 2018. Leo is made using only 4 ingredients. Leo Beer will be running sampling days and some great deals in the Wing Yip Stores this weekend, why not come down and join us. For Terms and Conditions for the instore promos please click on the links below. The perfect accompaniment to Asian cuisine.